HomeMarijuana legalisation in America: Here to Stay? Marijuana legalisation in America: Here to Stay? It was not long after a law was passed by the Uruguayan parliament to legalize cannabis in the country that its international legality was disputed by the International Narcotics Control Board (INCB), the United Nations’ (UN) drug-enforcement agency. On 11 December 2013, the INCB stated that the bill contravenes the Single Convention on Narcotic Drugs of 1961 (the Convention), just over four months after the bill passed through Uruguay’s Congress. The fact that Uruguay is the first INCB member state to pass such legislation suggests certain implications for other countries that have signed the Convention and have political parties that are inclined to pass similar legalization. Whether legalization has been hampered worldwide by the INCB’s announcement is yet to be seen. Colorado, a state in the United States, entered the New Year as the first jurisdiction in the US where production, distribution, and possession of cannabis are now completely legal, according to state law. However, the federal government, a signatory to the Convention, has still not given its sanction to the state’s new law, and cannabis remains illegal under the 1970 Controlled Substances Act. On the other hand, the fact that the US Department of Justice (DOJ) has indicated that they will not intervene in the state unless Colorado restricts possession and consumption of cannabis bought at Colorado’s enterprises to within the state’s borders suggests that the US government is essentially accepting the legality of its recreational use within US territory. The Convention lists cannabis and cannabis resin as Schedule I drugs, for which the maximum level of control by the signatory state is required as well as reporting on estimates of the size of the black market for that drug to the INCB. However, Article (4)(c) of the Convention does make an exception for medical and scientific purposes of using the drug, while Articles 29 and 30 stipulate that any such legal usage may only take place by a licensed entity or state enterprise. No part of the Convention allows for a signatory state to permit for the distribution, possession, and consumption of Schedule I drugs for purely recreational purposes. As a result, the legalisation of the recreational use of cannabis, as has been done in Colorado and Uruguay, appears to exceed what is permissible according to the Convention. The question remains whether the distinction between the US government’s mere non-interference with the Colorado legalisation versus the Uruguayan government legalising cannabis itself signifies that the US government has not breached the Convention in the way that the INCB has criticised Uruguay. 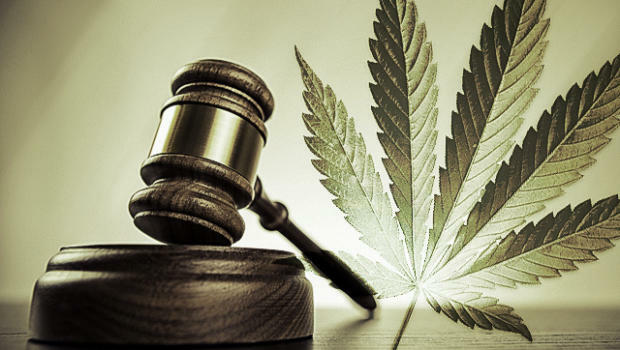 The purpose of this article is to determine the extent to which the US government risks coming into contravention with the Convention as further US states enact the legalisation of cannabis similar to the Colorado model. It does so by: (1) examining the provisions of the Convention that relate to cannabis, (2) providing one example of a country that obtained an exemption for one listed narcotic in the Convention, (3) looking at the degree to which the US government’s non-interference can be found in breach of the Convention, and (4) examining how federal law still does not condone the Colorodo legislization. The US government remains non-committal about continued acceptance of the Colorado situation, and given its signatory status in the Convention, the US government will most likely eventually clamp down on the legalization movement rather than let it expand to others. The Convention is explicit in its placing responsibility for the regulation of the legal drug trade on signatory states. The Convention mandates that signatory states are to limit legal possession of Schedule I narcotics such as cannabis to medical and scientific purposes under Article (4)(c), and Article 36 recommends “imprisonment or other penalties of deprivation of liberty” for all other forms of possession. Article 33 stipulates that states are not to permit the possession of cannabis except for medical and scientific purposes. Further, signatory states are to “control” all people, enterprises, establishments, and premises involved in the legal trade of cannabis under Article 30. As a result, it appears at first glance that the signatory state is given the most direct authority and mandate to regulate and control all legal commerce in cannabis and to ensure that illegal possession and commerce merit essentially criminal charges. There have been cases, however, where signatory states received an exception by the INCB. Most notably, Bolivia obtained what is known as a “reservation” for the traditional, generally indigenous use of coca leaves in the country in February 2013. However, Bolivia had quite unique reasons as to why it deserved this exception: the Bolivian constitution was amended in 2009, and it now stipulates that the government must preserve the traditional ways of life of Bolivia’s indigenous people, with an ultimatum that within four years the government must renegotiate international treaties that compromise this commitment. Although Bolivia initially tried unsuccessfully to amend the Convention as a whole before withdrawing from the Convention, it eventually re-entered with the reservation, thereby respecting its domestic constitutional obligations. There are unlikely to be such cultural or other grounds for making a reservation for cannabis and cannabis resin in the US or Uruguay. For that reason, the Bolivian precedent does not necessarily indicate that a similar exemption could be made for these latter two countries’ cannabis legalisation. Rather, given the hostility of some member states towards granting Bolivia the reservation it most likely suggests that obtaining a reservation is a difficult process, and one that requires a sufficiently deserving justification, such as cultural reasons in the Bolivian case. The question of whether the US Government is in breach of the Convention by virtue of its non-interference in the Colorado situation seems to be immediately answered with reference to Article (4)(c). As stated earlier, according to that provision, it is the signatory state that is to limit possession of cannabis within its jurisdiction to medical and scientific purposes. However, the INCB has yet to issue any statements whatsoever stating that the US government is in contravention of the Convention more than one full year after the people of Colorado voted for legalisation and the US government set out eight provisions for the state to keep legally purchased cannabis within its borders. The US state of Washington also voted in a referendum in November 2012 to enact similar legislation that is soon to take effect, thereby inching the US as a whole to becoming a signatory state in which Article 4(c) is not enforced throughout the country. Nonetheless, the absence of a public statement by the INCB does not, in itself, signify that the UN agency is not engaged in some form of behind-the-scenes dialogue with the US government and the federal Drug Enforcement Agency (DEA) on what mechanisms are available to end legalisation in Colorado and Washington. Further, the US government’s declaration that cannabis legally purchased in Colorado must remain in Colorado does not, in itself, constitute acceptance by either the government or the DEA of the full effect of the legislation. In short, we have not heard the final word from the US government on this issue. Moreover, the US government has a sound argument as to why they are not in violation of international law because of the federal money-laundering laws that banks in Colorado have so far been unwilling to break. As cannabis remains illegal under the federal Controlled Substances Act of 1970, banks operating in Colorado may risk large fines from federal bank regulators in addition to other penalties under 18 U.S.C. § 1956. As a result, it has become well known in the the press that the legal cannabis industry does all of its business in cash and that store owners and others in the business must take substantial safety precautions and considerations into account when it comes to paying bills and taxes. In such ways, federal law continues to serve as a significant disincentive for the establishment of legal-cannabis businesses in Colorado. While it does not completely fulfill the provisions of the Convention, it demonstrates that federal law has not acknowledged the state’s legalization to the extent that it has been synchronized. Overall, the US federal government has so far left significant legal obstacles for the cannabis industry in Colorado in the form of money-laundering laws and in the eight provisions that, on the surface, appear remarkably difficult to enforce. The position from the federal level has essentially been that the development will be watched without any explicit statement of the potential consequences if the state of Colorado is found to be insufficiently enforcing its part of this understanding. However, the nature of the federal government’s arrangement with the state appears too informal to know with any degree of confidence whether the DEA may not scupper this project and unilaterally begin to disenfranchise the cannabis industry in Colorado without much notice. What can be discerned from US government’s statements is the level of overall disapproval on the part of the DOJ and the DEA towards what is unfolding in the state. Therefore, the tenuous and uncertain soundings from federal officials will most likely begin to lean towards ending the legalization, if the position is to become more definite at all. Until then, the American public, particularly in Colorado and Washington, should start to watch out for any official statements from the INCB on their view of what sub-national legalization signifies. Excellent article Vicar!! You wrote: “federal law continues to serve as a significant disincentive for the establishment of legal-cannabis businesses in Colorado. While it does not completely fulfill the provisions of the Convention, it demonstrates that federal law has not acknowledged the state’s legalization to the extent that it has been synchronized. :” Question: What would it take to change Federal Law? A consumer movement? A Petition to Congress? Letters to Representatives? Any suggestions?